One should also not overlook that in science itself, you need intuitions. All successful research scientists function, to a degree, on gut instincts. They must make leaps, whether they have all the data or not. And at a certain moment, having the data doesn’t help them, but they still must know what to do. That’s when instinct comes in. I appreciate science. I don’t want to give the wrong impression. But the scientific way of thinking now dominates how we think about everything. We have become myopic. Mathematics and science are the most valued subjects, but the arts are now second-class. There are many ways to know something. Rationalism is good and has its place but there’s a kind of approach to science these days that seems to say that all that matters is what can be measured. Well, love, passion, well-being, health, meaning, purpose, beauty, aesthetics…….I could go on…..are not quantifiable. Yet they matter to us. We make our choices using more than rational thinking (and, don’t make the mistake of saying the alternative is “irrational” thinking). Intuition, aesthetics, and emotions all come into play, along with logic, in trying to lead an examined, worthwhile life. Science, however, shouldn’t be limited to what can be measured. I think Deleuze had it right – science is a way of thinking – a way of thinking about function. Science helps us to understand how things work. But we also need to think about concepts, percepts and affects. It’s not “anti-science” to be clear about the limits of science. Great post (in fact great series) across on successfromthenest on creativity. It was the title of the post which caught my attention “Saying you’re not creative is like saying you’re not human.” I couldn’t agree more. I do find it helpful to understand people by considering how they adapt to (or cope with) changes and challenges, how they engage with the world and how they create – I agree with Tony Clark about this – a lot of people think they aren’t creative because they don’t draw or write but we are all creative every day. How you make decisions, how you problem solve and how you express yourself is all based on creativity. blackberries, originally uploaded by bobsee. 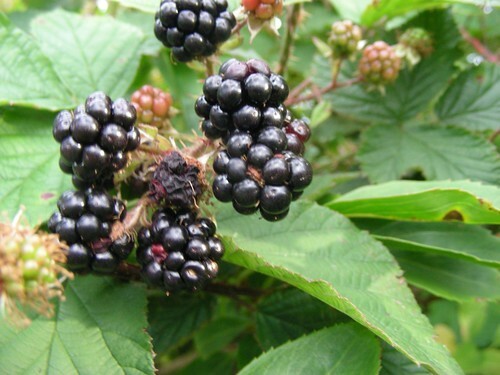 This season, moving out of summer and into autumn, is a time of berries coming to fruition. These ones look juicy and ripe. They are the advance guard. The first to come to this stage. Ripe. Ready. Just waiting to be picked and enjoyed. I never buy berries like this but I do enjoy them as I walk to work only at this time of year. This is one of the tastes of autumn for me. What tastes, colours, smells, do you associate with particular seasons of the year? Here comes autumn – endings or beginnings? brown leaves falling, originally uploaded by bobsee. Look at this! 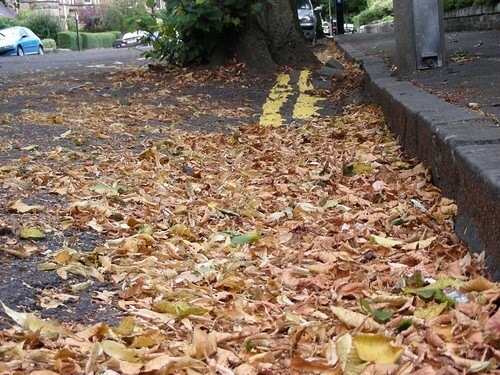 I took this photo this morning (August 30th) – look how many leaves have turned brown and fallen already! Is this the season of endings or beginnings? It’s the end of summer (OK, in Scotland we’re thinking “what summer?”) but its traditionally been the time to start a new academic year. In the UK doctor training jobs all start for the first time after graduating at this time of year. Of course some of you will be saying every ending is a beginning and I’m sure that’s true too – its all about what perspective you view it from isn’t it? But what does it say to you? On balance, does this time of year give you turn over a new brown leaf feelings of starting anew? Or does it feel a time of endings and loss? Now here’s an interesting concept – “free won’t” – which, it is argued, is an essential part of free will! Neuroscientists have shown that we use two different parts of our brain – one to develop an intention to do something; and a separate part to hold off doing it. If someone can’t hold off then they act impulsively. For example, children with Attention Deficit Hyperactivity Disorder who tend to have big problems with self-control. The researchers who did this work are calling the holding off ability “free won’t”. This is such an interesting idea. Probably somebody has told you at some stage in your life “Count to ten!” – that’s free won’t. This skill is the skill of choosing, so that your experience of life isn’t driven by unprocessed and uncontrolled feelings and urges (a life that is driven this way often feels as if it is happening to the person rather than giving them the sense that they are the active creators of their own lives). On the other hand, I wonder, do procrastinators have an overdeveloped “free won’t”? Is this the part of the brain they use to keep all those intentions under control?! OK, so this is how the web works. I sat down at my iMac and typed “Jack Kerouac writing tips”. Not sure why that came to me right at this moment but it did. I started clicking through some of the finds and came across a lovely blog called “myinneredge” where I read a post about Kerouac which mentioned Natalie Goldberg and I thought “it’s ages since I read Writing Down the Bones. I really enjoyed it” so I followed the link to her site and found she had just completed a film about Bob Dylan – “Tangled up in Bob” – what a great title! Not just because my name is Bob and I love the “tangled up” idea……. Thistle, originally uploaded by bobsee. How do we get a sense of self? I think “self” is created by the narratives we tell ourselves and others. We make our own sense of self from our experiences, mixing them constantly with our memories with our imaginations. One of our key capabilities as humans is language and our ability to handle metaphors is at the root of this. So, what I suggest you do is to see if you can become aware of the stories you tell yourself every day. The ones you create the sense of “Who am I?” from. There are many. Really many. 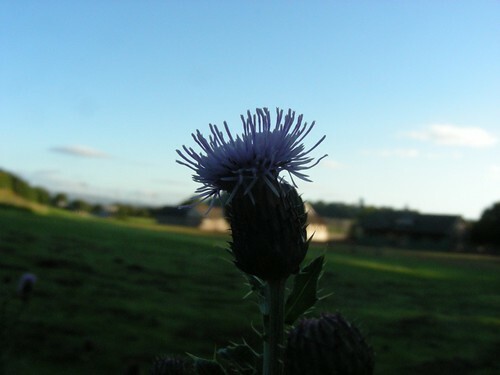 But one that came to my mind was provoked by the sight of this thistle. I took this photo of a thistle on my morning walk to work the other day. This is SUCH a powerful symbol for me. The thistle is Scotland. And I am Scottish. This place, this physical place, where I live, towered over by Stirling Castle high on its rock, surrounded by green fields stretching to the brown and grey and green hills, this is where I come from. This is where I belong. My family goes back in this town for a couple of centuries and more. I can feel my roots here. I feel sustained here. The energy, the colour, the smell of the air, the sunshine and the rain, the rocks, the trees and the plants, they all imbue me with a strong sense of who I am. What’s your geography of self? How does the place where you live, the physical environment in which you live, create your sense of who you are?